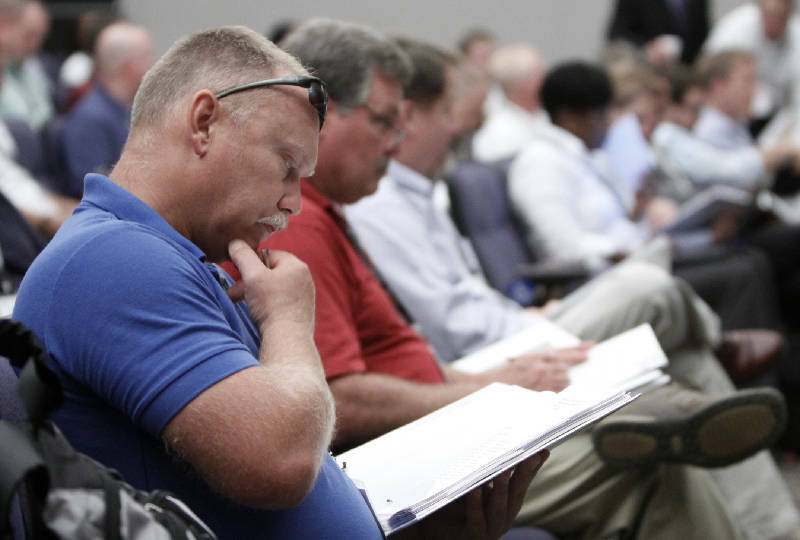 Wacker Chemical employee Ron Collee follows along in his book as CEO Ingomar Kovar speaks to the first wave of employees Monday during an orientation meeting at Chattanooga State Community College. Chattanooga State Community College carpenter Terry Coffelt adjusts the letters on as sign Thursday for the Wacker Institute at Chattanooga State, located in the former Olan Mills building adjacent to the main campus on Amnicola Highway. Wacker Chemical's chief executive said Monday the company's solar plant near Charleston, Tenn., could turn out bigger and come on line faster than originally planned. Wacker CEO Ingomar Kovar told the first 60 or so employees hired by the company that the factory may bring on a total of 700 employees, up from 650 announced earlier. "In the next 12 to 18 months, we could be up to 700," he said at Chattanooga State Community College, where the group began its initial day of training. Kovar also said the German firm's investment could exceed $1.5 billion. "At the end, it might be more," he said. In addition, the factory may be finished in the third quarter of 2013, a few months earlier than first planned, Kovar told the new employees. Additionally, Kovar said there is an opportunity of a future expansion at the Bradley plant, through Wacker's board hasn't approved one. "It's depending on the market," the CEO said. Wacker's new factory on a portion of 550 acres in Bradley County will make polysilicon, a key resource in the building of solar power panels for homes and businesses. 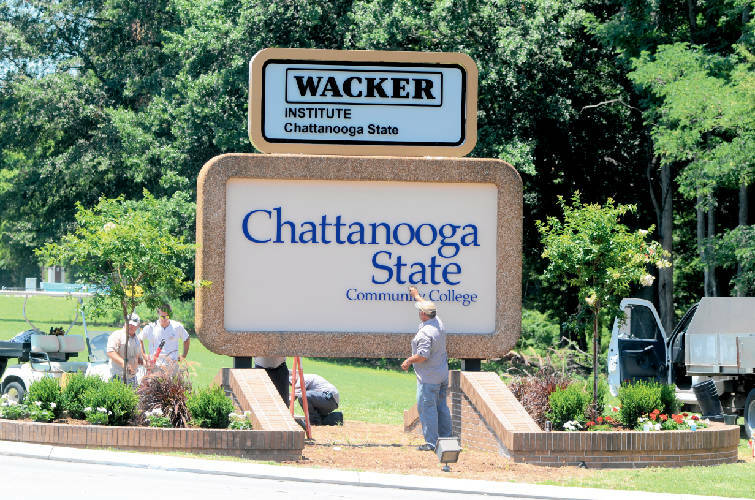 At Chattanooga State, the college joined with the company in creating the Wacker Institute. Wacker donated $3 million to the college for the construction of a state-of-the-art chemical training plant for the institute. About 4,300 applicants sought the more than 60 initial jobs, according to the company. The first employees, most of whom are lead chemical operators, will spend six months in Chattanooga and another six in Germany receiving training. When they come back to Southeast Tennessee, they'll help train new Wacker employees, officials said. Trainee John Crowe, of Knoxville, said he wants to work with cutting-edge technology. "I'll get in on the ground floor," said Crowe, 38, who plans to relocate to the Chattanooga area. Kevin Ervin, 26, of Tellico Plains, Tenn., said he sees Wacker as a place to build a career. Ervin said he studied chemistry in college and believes he'll like the work at Wacker. Erika Burk, the plant's human resources director, said lead chemical operators typically will earn in the low- to mid-$50,000 a year range with overtime and shift differential. "We're happy with the pool of applicants," she added. Jim Catanzaro, the college's president, said while Chattanooga State handles training for many businesses, the partnership with Wacker is unusual. "This is far more aggressive," he said. Jim Barrott, the college's vice president of technology, said Chattanooga State has hired five faculty members in connection with the Wacker Institute, and they've had training in Germany. Wacker's polysilicon production business is growing and prospects are bright, according to the company. Wacker is adding capacity in two German plants as well as its first such American facility in Bradley County. When the Bradley County site comes online, Wacker will have nearly doubled its polysilicon capacity to 67,000 metric tons annually, the company said.